About one week after September 11, 2001, the band called mr sterile Ensemble, played it’s first show at Valve on Vivian Street, Wellington, using guitar, trombone and drum accompaniment to the poems of mr sterile. The Ensemble became the Assembly several months after this show, incorporating an evolving concept in the delivery of a musical, creative, and political ideas. Stretching from a two-piece guitar and clarinet duo, to the wild seven piece including cello, trombones and rock band, playing a cabaret styled punk circus, to the jazz-skronk of stripped down drums/bass/guitar & sax, to the current refined two piece. The group has always diversified in sound-exploration, but the message has always been constant. Now the group is a two piece, bass, drums and vocals. Always easy to identify via the considered and dynamic onstage identity, remaining assertive in sound, we feel some significance that at this tenth birthday we revisits its original core of two, after a decade long and epically adventurous journey. It has been a moveable feast, a constant and circulating arrangements of instruments, personal, costumes, and sounds, leaving four audio releases, a book, and a bunch of other erratic merchandise and detritus in its wake. Debris scattered from Wellington, to the stages of the Czech Republic, Slovakia, Poland, Java, Malaysia, Australia, Singapore, & Mangaweka, the Assembly has entertained and amused, established connection and relationship, and entered into a global network of d.i.y creative and adventurous music makers. 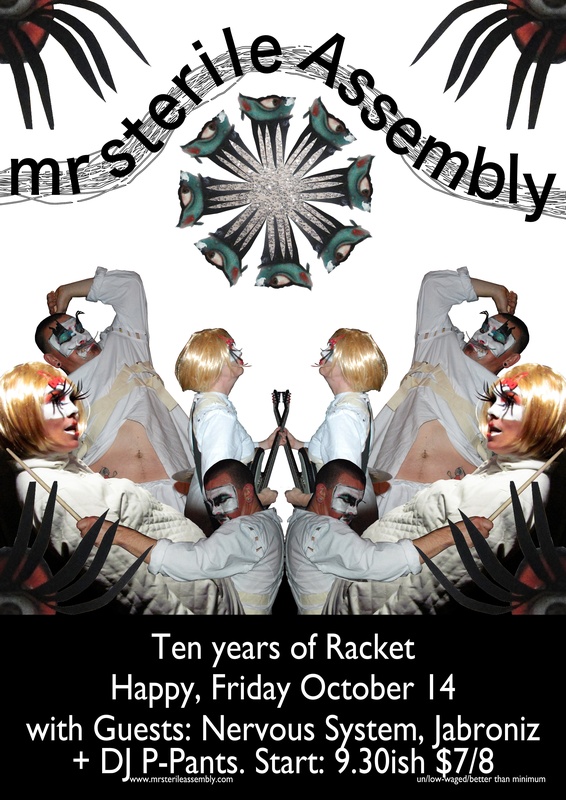 On October 14 Friday, the mr sterile Assembly invites you to Happy, on the corner of Vivian and Tory to celebrate with us ten years of racket. We would be honoured should you like to come along and entertain your evening with our celebration. A massive thanks to everyone who has ever been involved over the last decade – performers who have added their creative energy, artists who have shared their vision, fellow bands and performers who we have played alongside, and all the folk we have met and chatted with along the way. It is a huge and wonderful list. Sharing the stage with us this night are friends Nervous System, Jabroniz, +DJ P-Pants. Come along, we are officially feckless teenagers!